Durable and Solid - Heavy duty, each weighs 170g (6 ounces), made from a high-strength stainless steel alloy. Major axis strength is 25KN=5600 pounds. Double Security - Screw-thread lock carabiner design for additional safety. 1. Do not expose the carabiner to chemicals, avoid contact with substances such as sand which could scratch the protective finish. 2. Wash in warm water below 50 ℃ to clean, and then allow to dry naturally. 3. Do not allow the carabiner to drop from heights, otherwise the internal damage may occur. 4. Sore the carabiner in a dry, well ventilated place, and avoid contact with the heat source. Do not store in a damp location. 5. The carabiner follows both CE and CSA standards. The carabiner's life is related to its use. In general, carabiners should be replaced after 5 years. Recommendation: To ensure safety, please verify that the mountaineering carabiner is locked before you use it. Heavy Duty: Weigh 170g (6 ounces), made from a high-strength stainless steel alloy. Major axis strength is 25KN=5600 pounds.Size: Length: 11cm/4.33in, Width: 6cm/2.4in, Lock Diameter: 1cm/0.4in. Note: For safety, please look for "yougeyu" brand logo, as shown in picture! Purchased from Yougeyu store, quality guaranteed. Unique Design: High quality design with threaded nut on the lock catch. It is easy to connect to a safety belt and protection tools. Both convenient and safe. 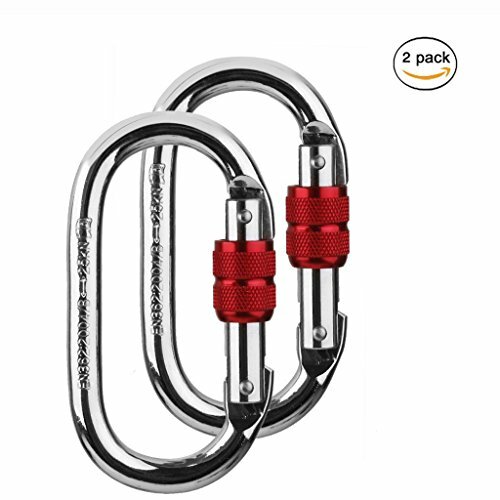 Multipurpose: Professional carabiner for rock and ice climbing, rappelling, working aloft, fishing, hiking, traveling, as a keychain, hanging a hammock, and yoga.